Even with protection of the ACAA, news outlets often report conflicts between passengers with disabilities and airlines. Quantum Consumer Advocates Jesse Cuellar and Josh McDermott have done a lot of traveling, and have experienced both good and bad circumstances while flying with their power chairs. Generally, I’ve had some good experiences while traveling to places like California or Tennessee. Airlines are fast and efficient in getting my power chair to me after I land, and my chair isn’t messed up when they bring it to me. Still, there needs to be a class or training for airlines, so employees can understand how to maneuver most power wheelchairs. Every situation is different, but half the time the airline staff doesn’t know what they’re doing. 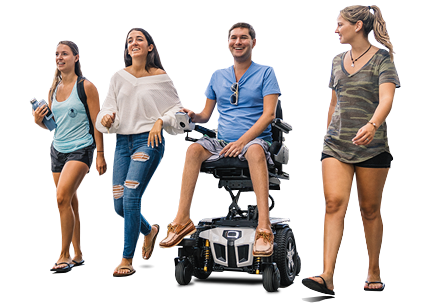 Power chairs are becoming more of a staple in the community and people need to learn more about them. I fly frequently with my chair. In 2017, I flew from Newark to Nashville for an industry tradeshow. The ground crew in Newark had difficulties getting my chair onto the plane, causing the flight to be delayed. When I arrived in Nashville, I found out my power chair had been damaged. The swing-away joystick mount was bent, and the joystick’s screen was totally smashed. The disability service team apologized for the damage on my chair, yet, it wasn’t their fault. Whoever loaded or unloaded my power chair onto the plane clearly didn’t know what they were doing. It’s important for airline employees to understand that these products are high-end rehab wheelchairs. We just about live in these chairs and they are custom fit to our needs. We can’t just go down to the local store after we land at our destination and buy a replacement chair. Airports and airlines need to be held accountable and they need to offer better education for their employees who handle our wheelchairs. If the device cannot be stowed in the passenger cabin, it can be stowed as cargo at no extra cost. After your flight, your device must be returned to you in a timely manner and brought as close to the door of the aircraft as possible, unless you request to pick it up in baggage claim. Furthermore, airlines must check and return your assistive device to you in the same condition as it was received.